That wasn’t what they said to each other, of course, and it’s also early days yet for us to expect any smooching. But although they are rivals for the inheritance and are constantly squabbling when they are at work, Hwan and Eun-sung do have a common goal: to revive the second branch. I love this dimension in their relationship, that they are working together for something that is precious to the person they both love: Grandma. That’s why this scene is special because there’s a shared excitement about something they want to achieve. As I was watching this episode, it suddenly hit me: Whether it is Hwan trying to change his grandmother’s mind or Jung trying to hang on to Jun-se, our characters are a dogged bunch. No one gives up. No one says: It’s all too much for me and I’m tired. I’m not going to try anymore. That’s why my title for this recap is Dreamers and Desperados. The line dividing the two is tenuous, but for simplicity let’s just think of the dreamers as the ones innocently pursuing their goals whereas the desperados are willing to sell their souls, if necessary, to get what they want. And now for the first dreamer in this episode. Isn’t it a marvel how peacefully Hwan is sleeping? Didn’t he cause a ruckus just 1-2 hours ago? Yet he sleeps like one savoring a sweet dream (unaware that a flower is sprouting from his head). Perhaps he sleeps that way because, like the knights of yore, he has thrown down his gauntlet. His punch and his “Yes, it’s because of Go Eun-sung!” are his ways of telling Jun-se to expect a fight. But there’s one question that Jun-se asked that Hwan did not answer: Do you like Eun-sung? What right do you have to ask me that question? You said you’re not in a special relationship with her. Anyway, why should I like someone who ruined my home? I don’t care about anyone except myself, but you go around like you’re the saintliest person, acting all considerate, appearing before me every day. I can’t stand seeing you like that! A denial that is an admission. An impulsive act followed by regret. Yelling at Jun-se and yet hoping Jun-se wouldn’t tell Eun-sung. Dismissing Eun-sung’s advice to soak his tired feet, yet remembering her words the first thing in the morning. Poor Hwan. How unsettling it must be to be this torn between your head and your heart. Five episodes ago, I wrote that Eun-sung’s battle with her stepmom was what kept me watching; everything else was secondary. But you know what has now become the most meaningful thing about Brilliant Legacy for me? Everything (except his hair) is changing. This is the Hwan who swaggered off the plane in Episode 1, who hated the smell of beef soup so much he went straight from airport to hotel instead of going home to see his family, just so he could avoid working in the restaurant. This same Hwan has just spent the whole day on his feet serving customers (and moving benches and potted plants!). No wonder he sleeps so soundly, not stirring when Grandma comes in with a basin of water and gently washes and massages his feet. In the darkness of the room, we see Grandma at her most gentle. Hwan is her heart; there is no one in the world she loves more. As she tells Butler Pyo earlier: No matter how I berate Hwan, I can never hate him. I will love him till I die and even after I have died. Grandma’s secret massage works wonders and the next morning our dreamer wakes up all refreshed and ready for work. He strides out of the house and I shriek. I’m not sure if it’s because he suddenly feels chilly, but our Hwan decides he needs an extra thick scarf. From a distance it looks like he has a snake coiled around his neck. At work Eun-sung and Hwan are told that they need to deliver fliers together. Unlike in the past when they would have protested loudly, both seem quietly pleased this time. 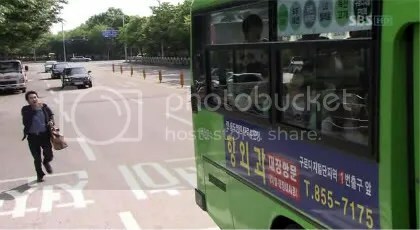 They arrange to meet at an apartment complex, she cycling there and he going by bus. Notice how Hwan now takes public transport without a second thought? How unthinkable that would have been just a few months ago. And look at his giveaway signs of unease in Eun-sung’s presence: touching his nose, pretending to look at the sky, saying he’s not tired when he is, acting cold and unconcerned. No wonder Eun-sung asks: Why don’t you smile more? Why act like you’re so upset with the world? My favorite scene on this day takes place after the two have finished distributing the fliers. Eun-sung buys a double-stick ice cream which she shares with the reluctant Hwan. (For someone who had looked at the ice cream with such disdain earlier, he sure eats it with delight.) As they get up to leave, Eun-sung applies a bandage to the blister on her foot. Then, just as she is about to mount her bike, Hwan startles her by applying his patented clasp on her wrist. He gives her a meaningful look, staring at her long and hard. Because what follows is the scariest bike ride ever (or the funniest; depends on whether you’re asking Eun-sung or asking me). Just look at the abject fear on Eun-sung’s face. Have you seen her more terrified? Compare her expression here with the one on her bike race with Jun-se in Episode 15. There, riding her own bike, our daredevil even took her feet off the pedals. Here, on the same bike with Hwan, she is clinging on for dear life. The poor thing must have aged ten years that afternoon. To hold his waist is the same as hugging him from behind. Wouldn’t that be too much for him, to be held so tightly by a woman he professes to dislike? But not holding him is to risk being maimed for life. Just look at how he cycles. It’s hysterical. Aren’t you supposed to lean forward, Hwan? Instead you’re doing the opposite. You look so comical, like a man wearing a back brace, shoulders straight and chest sticking out. No wonder passers-by point at you. No wonder you can’t control the bike properly. Or are the jolts deliberate so that Eun-sung has to grab you around the waist? You naughty boy. The two return to the second branch where Hwan is waylaid by Seung-mi. He leaves reluctantly with her, no doubt his heart still thumping from the bike ride. But Hwan is now a man with a goal, so he stops at a bookstore to buy books on entrepreneurship. At home he surprises Grandma by asking about her health, a far cry from the Hwan who didn’t care when the grandma went missing. The next day the scarf is gone (hurray! 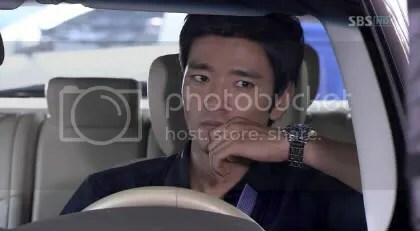 ), perhaps because Hwan and Eun-sung are out soliciting corporate deliveries this time and it won’t do for him to go dressed like he has a slimy reptile around his neck. I love the black-and-white combination, don’t you? Outside a wedding hall, after being turned down by the folks there, Hwan and Eun-sung argue at first. Then the ideas start to flow. They can try catering the beef soup to lots of other places: schools, hospitals, staff canteens and so on. Wow, the possibilities! It’s the first time we see the two so excited about something together. Remember Eun-sung saying earlier that Hwan doesn’t smile? What is striking about this scene with Eun-woo is how relaxed Hwan is. He lets his guard down, he smiles, he is so different from the tense person we’ve been seeing lately. It makes me feel suddenly sorry for all that he has been going through. Let’s leave Hwan and Eun-woo to finish their dinner and let’s move on to our second dreamer. To find her missing brother, to revive the second branch so that she can gain the inheritance and punish her stepmom, no one in the drama has more at stake than Eun-sung. But since the day of the second branch’s 30th anniversary, Eun-sung hasn’t been herself. Instead of being angry with Hwan for punching Jun-se, she tells Grandma how hard he worked that day. 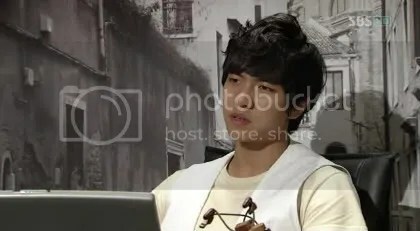 When Hwan returns, she reminds him that he has been standing all day and that his feet will ache the next day unless he soaks them before going to bed. It’s as if he has suddenly become her chief concern. You know, prior to this episode, I used to wonder how the drama would realistically portray Eun-sung falling in love with Hwan. Fifteen episodes down and she still hasn’t shown any romantic interest in him. Turning down Jun-se’s request to be her man isn’t because Hwan is in the picture; she has no inkling of Hwan’s feelings. When she tells the witch that she doesn’t want to be the main factor hindering Hwan and Seung-mi’s marriage, she means it. When she sees Hwan’s gregariousness with the old ladies, the warmth in her eyes isn’t indicative of a new interest in him. She’s simply stunned that he’s capable of teasing banter; it’s unlike his normal aloof self. So when and how would her feelings for him develop? The answer became apparent at the end of Episode 16. In that recap, I said that Eun-sung is likely the type to get jolted into a new awareness of the other person in a prelude to falling in love. Something happens and suddenly she sees and thinks of the person differently. The night of the second branch’s anniversary, while they are celebrating at the noraebang, Eun-sung sees Hwan looking constantly at her. At the same time, Seung-mi is clinging possessively to him. Eun-sung doesn’t give much thought to Hwan’s gazes; after all, the guy has always been strange. But somehow Seung-mi’s possessiveness bothers her and she keeps thinking about it. For the first time, she feels an unusual self-consciousness around Hwan, a shyness even. This new awareness of him is disquieting. If he comes upon her suddenly, she blushes and turns away. If she’s the one who spots him first and he’s walking ahead of her, unaware of her presence, she gazes at him longer than usual. Yet she competes playfully with him to see who can finish distributing the fliers first, and she buys a couple ice cream (the type that’s joined in the middle that you pull apart, one for each person) to share with him. When she sits behind him on the bike, that uncustomary closeness (and Hwan’s wobbly handling!) must make the passing scenery a blur to her. All she’s aware of is his back in her face. It’s the longest that they have been this physically close, their bodies touching. No wonder her face falls when they return to the second branch and Seung-mi trots in and takes Hwan away. Twice now it has happened. Seung-mi exerting her ownership over Hwan. Hwan following Seung-mi but turning back to look for Eun-sung, as if saying: I don’t really want to be in this position but I can’t wiggle out of it. Eun-sung reacting to the two of them like a person who is lost, not knowing where to look or go. It takes Seung-mi to make Eun-sung feel out of sorts. Seung-mi. One among the several desperados in this episode. The only person to witness Jun-se and Hwan coming to blows at the noraebang. Hwan doesn’t love her, he loves Eun-sung. The next day after work, Seung-mi waits for Hwan at the second branch and sees him cycling back with Eun-sung. They do not realize she is there. Our desperado has perfected the art of hiding behind walls; it gives her a vantage point to see and hear everything without being discovered. Seeing Eun-sung holding on to Hwan, Seung-mi’s face darkens. Not only are the two going everywhere together, supposedly for work, they’re now using the same mode of transport? This absolutely must stop. So, in a desperate move, Seung-mi calls Eun-sung and asks her for Eun-woo’s latest photo. She will use that photo to publicize his case on a Missing Persons Internet forum. If she can help Eun-sung find Eun-woo, then perhaps Eun-sung will be so grateful she will not take Hwan away from her. While she is at it, why not seize the opportunity to reiterate to Eun-sung how very important Hwan is to her? Hwan is like water and air, the ground I stand on. Without him, expect me to evaporate like the mist, to die! You’re not going to be so evil and rob me of the very thing that sustains my life, are you? Less desperate but no less inventive is our Jung. Undeterred by Jun-se’s rejection, Jung remembers what he said about liking Eun-sung’s thoughts and personality. So our junior desperado decides to observe Eun-sung. Following behind her rival, she sees Eun-sung greeting the older folks in the family and offering to help with breakfast. So Jung gets her cue and starts rattling off one “Good Morning!” after another, complete with bowing. The reaction from everyone is hilarious. Will Jung’s efforts pay off? Not likely, at this stage. Even though he has been rebuffed by Eun-sung, Jun-se is not about to give up. On the contrary, his resolve has strengthened, thanks to Hwan’s punch and Eun-sung’s ambiguous assurance that she might accept him if her situation were different. I hate including Jun-se in the category of desperados. As of this episode, he hasn’t resorted to desperate measures to win Eun-sung. He isn’t badmouthing Hwan; neither is he in cahoots with Seung-mi to separate Hwan and Eun-sung. But to say he isn’t changing would be a lie. There’s a certain grimness on his face now when he thinks of Hwan. 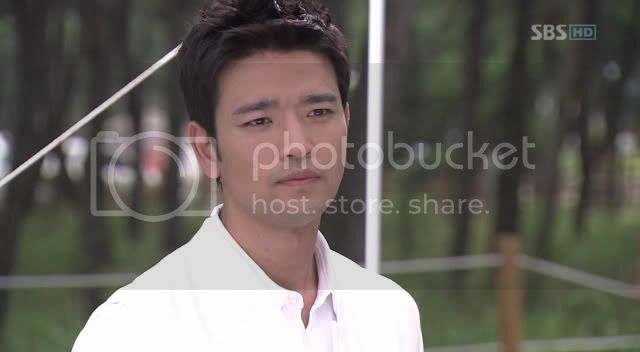 And when he sees Hwan and Eun-sung talking animatedly as they return to the second branch, his expression hardens. Still, I’m optimistic that Jun-se’s good sense will prevail and he will not become another desperado. We have enough of them in the drama as it is. In fact, let me introduce you to our very first desperado. Eun-sung’s dad. Pretending to be dead so that his family can collect his sizable insurance payout. Even though he didn’t cook up the idea, in his desperation he took advantage of a commingling of circumstances and as a result caused his family to fall apart. Worse, he isn’t doing anything to salvage the mess. On the contrary, he is allowing his wife to make his cesspit even more malodorous. Despite not knowing each other that well, the two men have a genuine affection and respect for each other. Both are sad to know that it might be a long time before they meet again. I hope you find yourself a good girlfriend, the older man says, his words more loaded than he realizes. All his worldly belongings stuffed into a small bag, Eun-sung’s dad is about to leave Seoul. His destination? A faraway province. His new vocation? Farmer. Whose idea? Who else? The witch is furious when she learns from Hwan’s mom that the grandma has no intention of chasing Eun-sung out of the house. 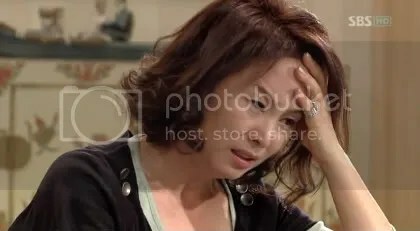 Her husband, on his part, is desperately trying to find out why Eun-sung has stopped sending him email and in fact has deleted her email account. And that’s exactly what her husband does, leaving everything behind in Seoul and getting ready for a life among fruit trees. As he waits at the bus stop for the bus that will take him to the station, a bus passes by. In that fleeting moment, as if an invisible force is guiding his eyes to look in that particular direction, he sees a familar face on the bus. Even though the bus doesn’t stop, and the person he has spotted doesn’t turn her head, he recognizes her. Thank you Thundie for your hard work. I read in your twitter that you were bored to tears with your own writing…it must be hard on you. It might not mean much to you but I love reading your insights sprinkled with your wit and sense of humor. So I for one truly appreciate your recaps. I love Hwan’s transformation from a spoiled brat to a man with a heart. He’s growing up right in front of our eyes. Also, I never noticed that they all have the never give up attitude until you pointed it out. BTW, I think at last they ran out of scarves from LSGi/Hwan’s wardrobe…if my memory serves me right I haven’t seen them lately. YIPEEE! Yay!!!! Thundie you are awesome awesome much!!! I didn’t expect another recap from you so soon but i’m all the more grateful for it really. I love the drama and normally have a blast doing the recaps. But somehow this particular one was really hard to do. I think the main reason is because I watched eps 17-18 together and I really LOVE ep 18. Ep 17 is the usual solid and entertaining BL episode, but it’s not a standout. I wrote abt 1500 words (just on Hwan alone! ), but everything felt so dull. He did this and she said that; the words were as alive as a glob of glue. So I lopped off entire sentences, even paragraphs, and rewrote the whole thing. Ep 18 won’t be a problem, lol. I have so much to say about it and will start asap. Oh, before I forget. Some comments have been randomly appearing as spam (I don’t know why). If you don’t see your comment appearing immediately, please don’t worry. It will appear later. WordPress eventually sorts it out somehow. So please do comment. More than hits/reads, comments are what I covet!! Thank you! Jun Se is definitely very good looking. I wonder how his girlfriend feels about the chemistry he has with Han Hyo Joo. Because I love their camaraderie. Especially in the episode where she cooks at his house. It felt too real, like I was intruding on a private scene. Go watch now! You won’t be disappointed. I’m caught up and I’m totally loving it. I’m gonna be all out of sorts once it ends. I have no idea what else I should start watching! Hey Thundie, I hope this episode was not too tough on you. Without you, it never would’ve crossed my mind the thing around Hwan’s neck is indeed a reptile! I’ve always thought he wanted to rival Junseh in the boxing ring with that towel around his neck. Alas, he might be growing a snake. Hwan and ES working together is among my favourite things about the drama. I thought the writer would take advantage of the ‘living on the same house’ angle and do the usual K-Drama take of them bumping into each other every 30 seconds, but I’m glad she took it to work instead. But yeah, I love Hwan and ES working together. They, who initially hate each other, can put aside their differences and actually work together without one trying to sabotage the other. I also like it because in this issue, Hwan and ES are equal. Well, not THAT equal since ES’s still on the line for the inheritance while Hwan isn’t, but I mean Hwan cannot intimidate ES because ES is technically his senior at work and ES’s work is just equally good, if not better, than him. Yet he sleeps like one savoring a sweet dream (unaware that a flower is sprouting from his head). Reading this I’m seriously tempted to watch the series. Love how you add your thundie stamp (those personal remarks) to your writing and make it so interesting. I didn’t even notice the contrast of the daring and frightened ES when she’s on the bike… that’s real detailed observation! Can’t wait for more juicy recaps!! thanks for the great recap Thundie! Can’t wait for ep.18!! yeah! me too!!! i can’t wait until hwan and eun-sung are marrying. Agree with tsunamiblues – that line totally brightened up my day, haha! HA! HA!HA! I HAVE TO POST THIS FIRST THUNDIE. I CAN’T HELP LAUGHING TO YOUR COMMENT ON HWAN’S HAIR. YOU JUST CAN’T IGNORE IT FOR ONCE. OKEY, I FINISHED READING THE REST OF YOUR ANOTHER ENTERTAINING RECAP, THUNDIE. I AM A HELPLESS ROMANTIC. SO I WAS TICKLED TO DEATH WHEN HWANNIE OFFERED TO BE THE DRIVER WHILE EUN-SUNG WAS HUGGING HIS WAIST SO TIGHTLY. AND I’M ALSO A DESPERADO. I DESPERATE TO WATCH THE REST OF THE REMAINING EPISODES. I CAN’T WAIT TO SEE HW AND ES TOGETHER AT THE END. I JUST DON’T KNOW THEN HOW I WILL FEEL ABOUT JUN-SE. Thank you for another recap of BL. I hope you will continue to sum up the upcoming eppies. E18-22 are solidly constructed and played out; even quite lovely at some points so would love to read your perspectives on them. I too am growing fond of the characters in this drama. The weakest links for me are still the daddy and brother stories. Insufficient development, too laggy … seems almost like an afterthought by the writer. Feel as if she is squeezing in their stories wherever there is time in the episodes. If she can attack these subplots with more gusto, it would make the storytelling more consistently believable. I do admit that I love the way she fleshed out and layered all the other characters, especially Hwan and Eun Sung. A lot of care going into writing up our couple. The buildup to their union is very convincingly done. The bike scene is classic – hilarious but is so very Hwan-like. haha. I hope that’s not too bad of a spoiler. Bee, thank you. Which eppie is that from? Psst, I returned the favor in the ep 18 recap. Sure to make you gasp more than once, hehe. I’m all caught up now (ep 22) and know where the pic of Jun-se is from, lol. Aww, that new hairdo is da bomb, he looks so boyish and handsome, ahhhhhhh! Seung Mi was one desperado that hadn’t occurred to me – I put her solidly in Camp Evil once all the lying started. The reason she will lose Hwan completely is precisely due to what you pointed out – that Hwan is everything to her – she needs to grow beyond needing a crutch to live. It’s also why Eun-sung is the stronger one of the two sisters. Lots of people feel sorry for her, but my sympathy is overwhelmed by the enormous wave of disgust at her lack of backbone. thundie, hehe. Just so you know, I have personally created a subfile for BSB pics in my PB pro. Magazine, article photos, etc.. not just BL pics. Yes, he is an important part of my life now. If he is a singer, I’d subbed his MV by now, LOL. sevenses: I don’t know why Seung Mi allows herself to exist only in relation to Hwan. Tsk tsk, women should never be defined by the men that they love. Go work on your career, Seung Mi. I faintly remember that she has a job, though we rarely see her these days doing anything beside stalking Hwan/Eun Sung. Her wardrobe is quite lovely for someone who rarely seen working. I envy the hair too. E24 is good; some scenes were slightly overdone but overall, solid.